The Voyager 1's probe is, to paraphrase Star Trek, to go where no man has gone before. And according to NASA, data shows that Voyager 1 is nearing the final frontier of the Solar System and may soon enter the interstellar medium. NASA launched Voyager 1 on September 5, 1977 as part of the Voyager Program and the Voyager Interstellar Mission. Voyager 1's main mission was to study the planetary systems of Jupiter and Saturn, but after Voyager 2, its sibling probe, made a close flyby of Neptune, NASA extended the two probes' missions to study the outer boundaries of the Solar System, and perhaps beyond. 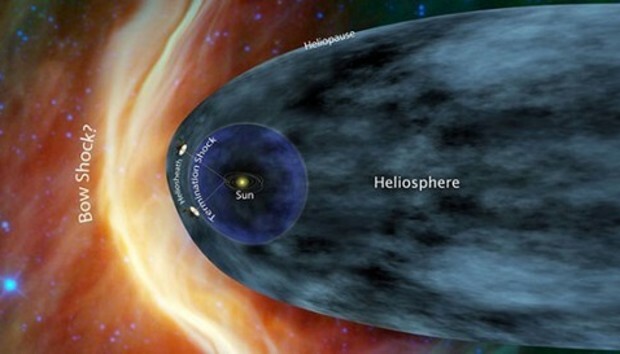 Currently, Voyager 1 is traveling at the relative velocity of 38,120 miles per hour with respect to the Sun, and the probe is currently inside of the heliosheath--an area of the Solar System where solar winds are slowed and turbulent. Voyager 1 has been in this area of space for several years now, but NASA says that Voyager 1 reached an area of space called the magnetic highway on August 25. The magnetic highway is a region on the outer edge of the heliosheath where charged particles travel into and out of the heliosphere--the massive bubble of space surrounded by the heliosheath that contains the Solar System. This is the second of three signs that NASA says will determine when Voyage 1 has reached interstellar space: The craft has detected charged particles flowing out of the Solar System along the solar magnetic field, as well as cosmic rays from outside flowing in. "We saw a dramatic and rapid disappearance of the solar-originating particles. They decreased in intensity by more than 1,000 times, as if there was a huge vacuum pump at the entrance ramp onto the magnetic highway...We have never witnessed such a decrease before, except when Voyager 1 exited the giant magnetosphere of Jupiter, some 34 years ago." Voyager 1 has yet to detect the third indicator--an abrupt change in the magnetic field. We are still waiting for Voyager 1 to stop picking up the Sun's magnetic field, and for it to take notice of an interstellar magnetic field. No one knows just how much further Voyager 1 must travel until it reaches interstellar space--it could months or even several more years. But one thing is for sure: After 11 billion miles, Voyager 1 is sure getting close. To learn more about these events be sure to check out the Voyager Mission News, and the official Voyager Interstellar Mission page.